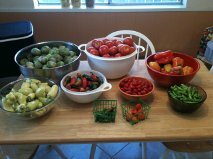 A few years ago my mom and I developed our own salsa recipe. I’ve been making it for several years for my family. In the past, I’ve taken one day to can up a salsa storm and stock my pantry for the year. Chips and salsa are my go-to “bring a snack to share” item, and I often hear from my friends, “You should sell this!” This year I put the offer out there, and the response was much more than I expected! I am blessed and thankful! I’m thankful for the talent God has given me and that other people appreciate my salsa as much as my hubby does. I’m thankful for the opportunity to share my talents with others and bring a little extra money into my home. And speaking of money…you have to spend it to make it and I underestimated. I only took into consideration the cost of jars and trips to the farmer’s market. If I were to take into consideration the time I put into it and the cost of electricity, my profit would be a whopping $0! I have to raise the price (which I totally hate, hence the justification below). But I learned that it’s important to value myself and my talents. If I don’t, others won’t either. So after crunching some numbers, the price will be changing to $7 for 16 oz. BUT if you return your jar, you’ll save 50 cents off your next jar of salsa (making it $6.50) or any other canned product available. And to justify a tiny bit more, I noticed that the “fancy” organic green salsa at HEB is $5.99 for 8 oz. and the red salsa is $5.99 for 12 oz. Shipping is expensive! So until further notice, my canned products will only be available locally. I have yet to find an affordable way to ship the jars. There are some wonderful, hard working, friendly people sweating their booties off at the Tomball Farmer’s Market every Saturday year round (9am-1pm at the corner of Main Street and Cherry Street). I will definitely be going back, and I’m hoping to one day pitch a canopy and sweat my booty off with them. Thank you to everyone who purchased a jar or 2 or 4 to help me kick off the canning department of My Hippie Creations!! 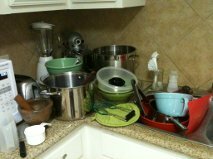 And now I think I’ll put my feet up and relax…right after I tackle these dishes. Very proud! We served salsa last night at our gathering, as always, it was a big hit. I tell everyone how we worked out the recipe together and that makes it even better (at least for me). I’m glad to see this working out so well for you. Also, I talked about your price increase to my “20 something” guests and they all thought $7 is still a great deal!